Sussex have signed Pakistan left-arm seamer Mir Hamza. He will join for nine first-class matches in the 2019 season - eight Specsavers County Championship matches, starting with the away fixture against Northamptonshire that begins on May 20 and finishing with the match against Lancashire at Old Trafford starting on July 13. The Karachiite’s stint on the South Coast will take in four of Sussex’s home fixtures in the competition, three at the County Ground and the match against Gloucestershire at Arundel Castle in mid-June. 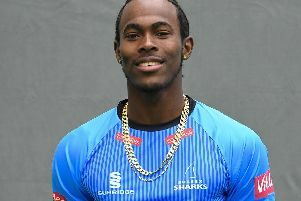 The 26-year-old will also be available for the tour match against Australia A at Arundel between Sunday, July 7 and Wednesday, July 10. Hamza said: “I’m very excited to have the chance to play county cricket with a great club like Sussex, following in the footsteps of Pakistan legends like Javed Miandad and Imran Khan. Hamza made his Test debut for Pakistan in their crushing 373-run win against Australia in Abu Dhabi earlier this winter. He caught the eye with his dismissal of Shaun Marsh via a fine seaming delivery that knocked the opener’s off-stump out of the ground. In ten first-class matches for Pakistan A, Hamza has taken 25 wickets, including a best of 4-53 against Yorkshire at Headingley the tour of England in 2016. Later in the same tour, he took 4-62 against Sri Lanka A at New Road. England supporters may also remember Hamza’s performance for Pakistan A in a two-day match against an England XI in October 2015 when he picked up the wickets of Alex Hales, Jos Buttler, Johnny Bairstow and Moeen Ali on his way to figures of 4-34. In total, the Karachi Dolphins player has taken 282 wickets in 59 first-class matches at an average of 18.34.